I have recently come across Swans Down extra fine cake flour. 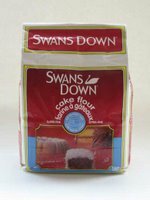 On the package is this statement: “Since 1895, Swans Down cake flour has been specially milled from soft winter wheat to give all your cakes a fine, velvety texture.” If it’s been around since 1895, why haven’t I heard of it till now? Oh, I know, it’s because it’s made by a company that markets to Eastern Canada and I grew up in the West and because it’s not easy to find. I discovered Swans Down at Summerhill Market in Toronto and have heard it’s only available at a small handful of stores in Toronto. The 1 kg bag at Summerhill Market costs $4.29. Milled incredibly fine, this flour has the feel of potato starch. I think it is useful for cakes that require a light, delicate crumb. I plan to experiment with it over the coming months. If you know other places to purchase Swans Down in Toronto, please let me know. 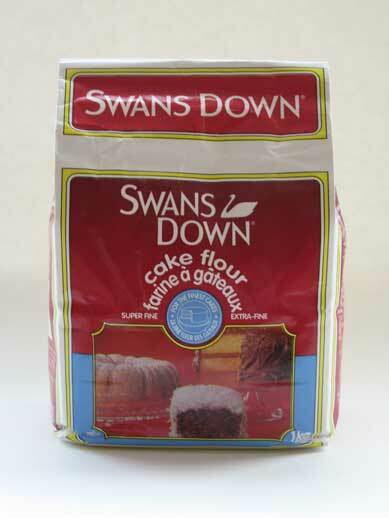 Swans Down Cake Flour is made in Canada and is a product of Dover Industries Limited, www.dovergrp.com/index.htm. The website, however, does not list their retailers. Posted by Sam at 9:39 a.m.
Sam ... I thank you profoundly! I have been looking for this flour for quite some time. It was recommended by a family acquaintance. Now I know where to get it!